Building Outdoor Gear is the result of decades of building and trail testing outdoor gear. From canoe paddle and pack frame to reflector oven and trip box, you’ll find clear, concise instructions for making the equipment you need for a pleasant adventure, whether you’re camping, fishing, hunting or canoeing. 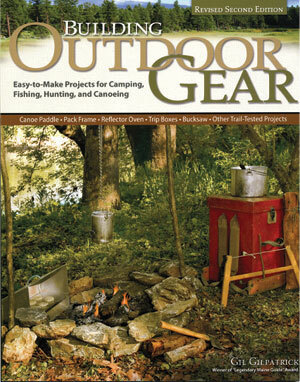 This newly revised second edition of Building Outdoor Gear includes plans and patterns for classic outdoor essentials, along with step-by-step directions featuring color photos. As a hands-on Outdoor Resources instructor, I managed to perfect, field test, and build sporting equipment that meets the demands of the most serious enthusiast. Show your pride on the trail with your own hand-built equipment that really works. Quality paperback, 8 1/2 X 11”, 118 pages. With color photos and precision drawings. $19.95. Hatbands are a great way to display your skills and silently tell others about yourself. I have not found a paddle that compares with these for strength, lightness, and flexibility. And, you can add your own decorations! These boxes are tough, rainproof, roomy, and backpackable - I cannot imagine packing for a trip without them.